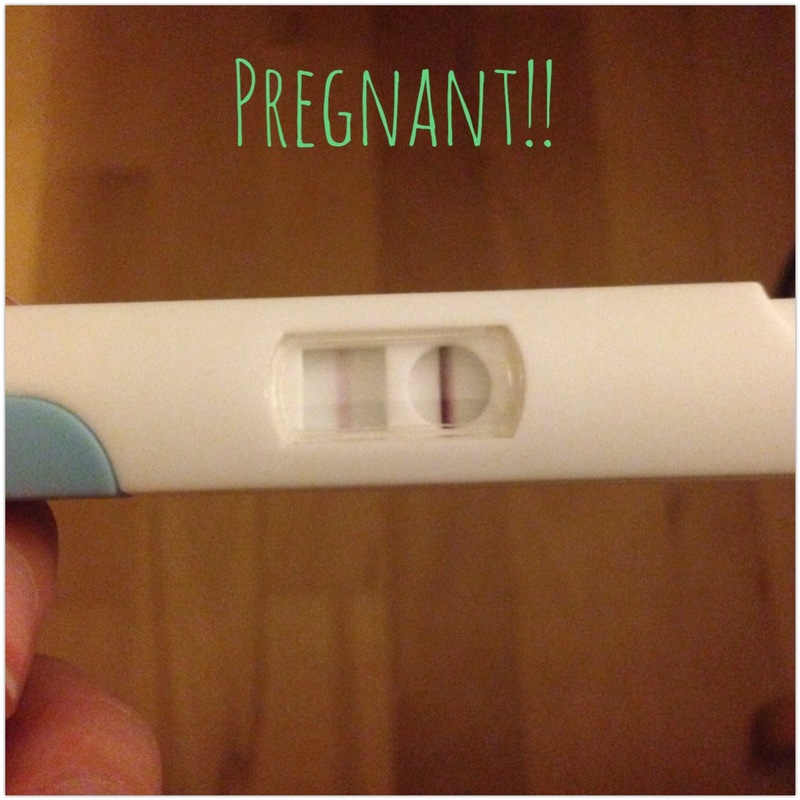 My Pregnancy Journey: Trimester One! As I near the end of my second trimester of pregnancy, I thought I would reflect on my journey with bump so far. There have been a lot of highs and lows second time around, mainly caused by the severe sickness I suffered with in the first trimester… The beginning… And finding out! We hadn’t been trying for baby no.2 for a long time but we did receive the ‘magic ovulation box’ soon after so I was quietly confident. Basically this is a pack of ovulation sticks from Boots (or possibly Superdrug) which has been passed through my group of friends. Anyone who has been given this box has fallen pregnant within a month! I was the fourth person in the chain. Whether it was just positive thinking or mystical, I guess we will never know 😉 But it worked. After the high of getting the box, we had another, falling pregnant within a month. I tested early even though I showed no symptoms and the line was so faint that I thought it was a negative result. I was about to throw it in the bin and a sliver of a line caught my eye. Andy wasn’t convinced so I tested again for the next two days. This was the result on Day 3. Even then the line was quite faint. A week later the sickness started. Initially it was just feeling a bit queasy at the smell of a takeaway and the following day it kicked in… Completely. Nothing I ate stayed down and it was exhausting. I lay on the sofa and my eyes just kept closing. Annabelle kept trying to get me up and about to play with her or just keep her company but my eyelids felt so heavy. My mum had to drive up from London to look after Annabelle as there was no way I could sleep instead of looking after her. As well behaved as she is, she is only a toddler and I couldn’t risk her safety by falling asleep even for a minute. This then became my ‘routine’ for the next few weeks. Sleeping like a newborn, trying to eat and running to the bathroom. I became dehydrated and lost nearly a stone in weight. My calves would ache walking up and down the stairs and I would be breathless. As well as feeling exhausted, I felt like such a bad mother. Annabelle wanted my time and attention and all I could do was sleep. On top of the guilt was the worry about baby’s growth and development. I tried anything and everything to keep food or drink down, ginger biscuits, milk, vitamins but nothing worked. My mum had to work part-time at the University so she drove Annabelle and I to stay with her in London and my Uncle would help to look after Annabelle while she was at work. A few weeks in, I knew I couldn’t go on like this as I didn’t want to cause any harm to the baby. I needed to have folic acid and nutrition for bubs and I needed energy not only to prevent organ failure for me but to be able to look after Annabelle as a mother should. I phoned the NHS helpline and if I’m completely honest, they were awful! They reluctantly ‘booked an appointment’ at the hospital, which turned out to be nothing at all. There was a two-hour wait and they hadn’t given the hospital any of my details. I couldn’t stand the smell or bear sitting in the waiting room so after the receptionist took pity on me, she asked the nurse to see me. This was a complete waste of time too. She made me feel like I was being a hypochondriac and told me that everything I was going through was a completely normal part of pregnancy. She suggested I wait another couple of hours to see the doctor but I had had enough. I wanted to go home. My mum drove us back to Bath and I booked an appointment with my regular GP. It was two-hours of discomfort and sickness in the car but worth every minute as I can’t sing my GPs praises enough. She is amazing! 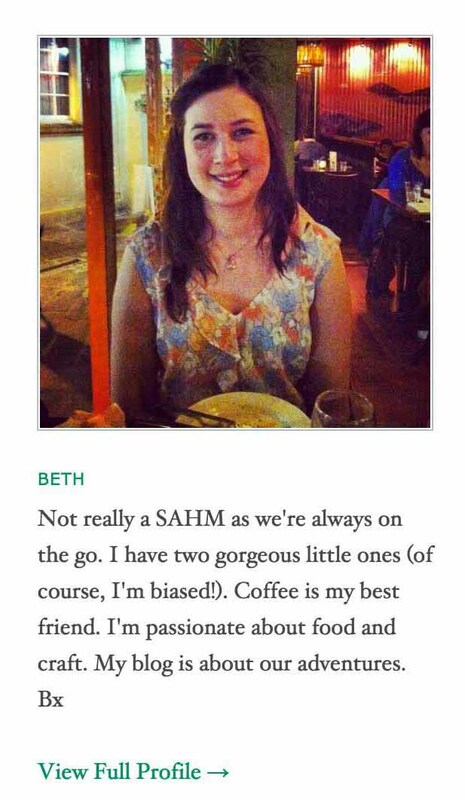 She squeezed me in and researched Hyperemesis gravidarum into such detail. She wanted to make sure that she chose the best medication for me. I had Prochlorperazine (Stemetil). I was still sick with this tablet but I wasn’t dizzy as I was with Cyclizine and the longer I took it, the less sickness I experienced. She referred me to the early pregnancy clinic at the Royal United Hospital as I had been bleeding and I had a scan at 8 weeks. Baby was amazing and exactly the right size. Everything looked healthy and as it should. 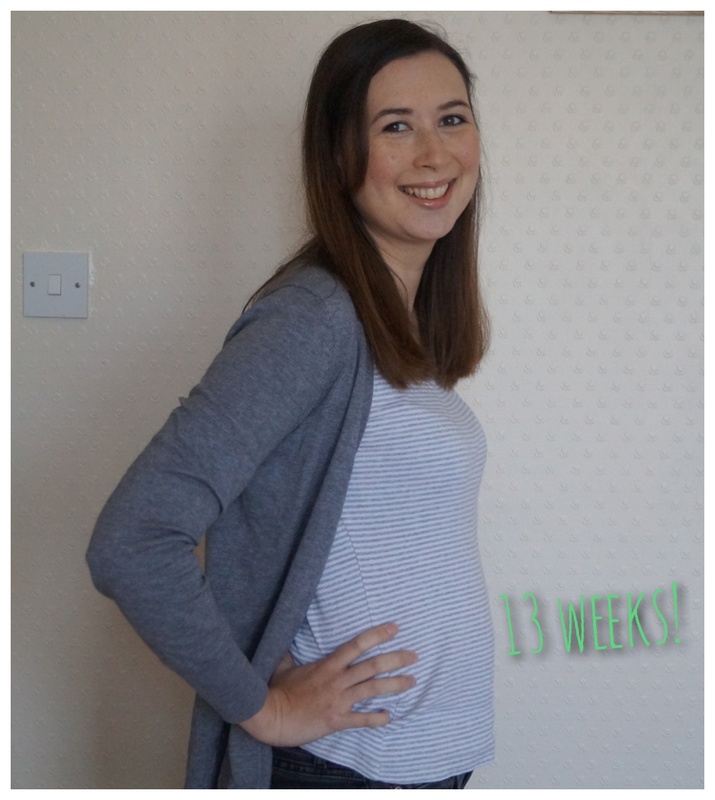 Welcome to my 23 week pregnancy update. I definitely think my bump is bigger this time round but unfortunately I didn’t take any pictures or measurements last time to compare. Enjoying the warm weather in this pretty vest top but it does feel a bit muggy. Look how much my belly button has popped out! I’ve gained: No change from last week so I am still my pre-pregnancy weight. I regained the 13lb/6kg I lost from Hyperemesis gravidarum, (really bad morning sickness). I seem to put on about 2lbs every fortnight. 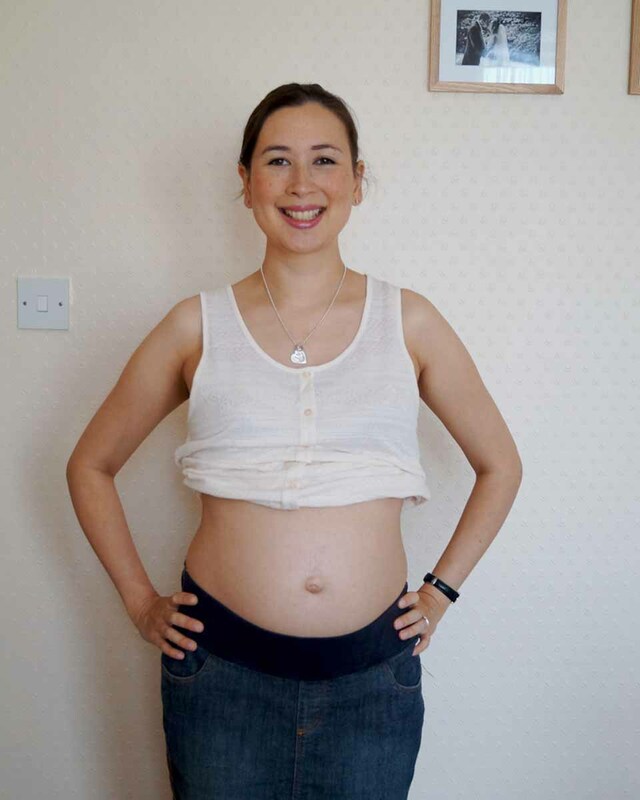 I’m wearing: A maternity jean skirt from Mamas and Papas. My friend gave me a massive bag of maternity clothes and this was one of my favourite items. It has an elasticated band at the front and adjustable bands on the side. 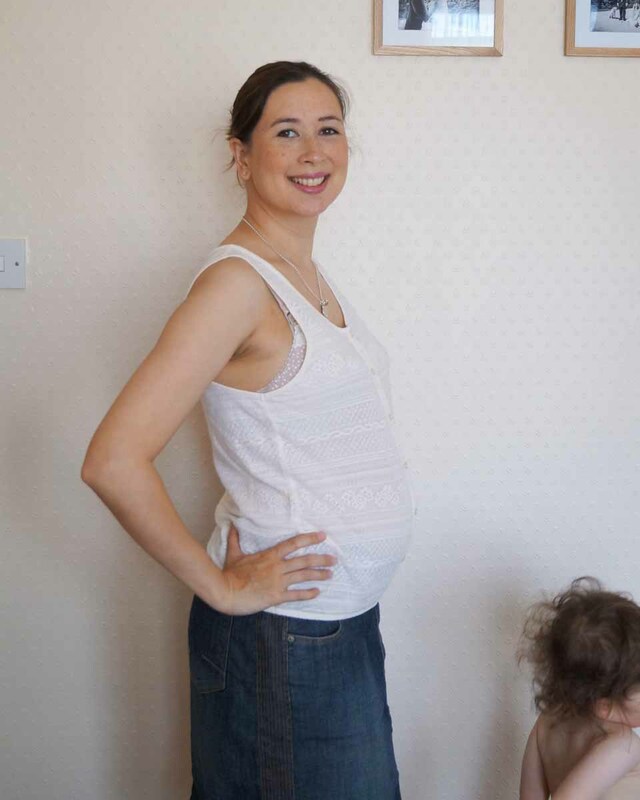 The vest is a non-maternity top from River Island from a couple of years ago. How I’m feeling: As you may have seen in my 22 week pregnancy update, I looked quite tired at 23 1/2 weeks. I keep having vivid dreams and waking up unsettled as a result, especially one night where I dreamt that I lost my wedding ring. I am feeling a bit panicked that I don’t have everything I need for the new baby but there are only a few things left to buy and none of them are essential either. Highlight: Annabelle’s swimming is also a highlight this week too. She swam another length on her own but with a swimming float this time. She seems to be gaining more and more confidence in the water and it is such a shame that we only have one more lesson until September. I will be heavily pregnant by then and she will start pre-school too so I’m not sure if we will be able to take any lessons. The baby is: The size of a large mango and boy can I feel it! It wriggles around like anything and if I’m talking to Annabelle or Andy it really wants to be involved in the conversation. There are definite movements in reaction to sounds and pokes. It often sits in very uncomfortable positions as well! Often pressing on my bladder and making the base of my belly feel really stretched. I don’t remember Annabelle being this uncomfortable. Food cravings: I’ve gone off ready made Spaghetti Bolognese as it tastes so salty. I have been enjoying anything cold and refreshing and even dreaming of watermelon. I may have to ask my mum to buy me another piece as I see her today. I love eating it with Halloumi cheese. My sweet tooth has also gone into overdrive and I have chocolate and/or ice-cream everyday! Kelly’s Cornish Clotted Cream Ice-cream is the favourite in original or honeycomb flavour. Symptoms: Again other than tiredness, it’s been another pretty good week! I’ve had a couple of cold symptoms: sore throat, sneezing etc but they seem to be in the morning and disappear before lunchtime. My body: As mentioned in my recent Lush Cosmetics post, I seem to have dry skin at the moment. This may be why I’m craving refreshing food and drinks. I’ve been trying to up my water intake and I’ve been smothering my belly (the worse area) in a coconut moisturiser from the Body Shop. It smells amazing! Any mood swings? A little bit irritable and restless from tiredness but generally happy. I’m looking forward to: It should be a relatively quiet week so I guess I’m looking forward to the little things like playing in the sunshine with Annabelle and eating some watermelon.